Mian Computers & Communicators Sales & Service deals in sales, service and repair of new and used laptops, computers, printers and accessories. 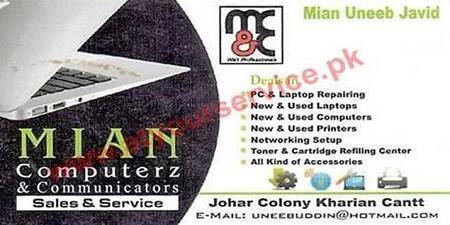 Mian Computers & Communicators Sales & Service is located in Johar Colony, Kharian Cantt. It deals in sales, service and repair of new and used laptops, computers, printers and accessories.